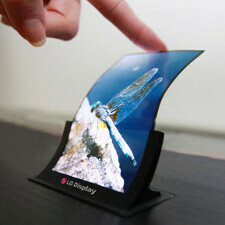 LG Display has confirmed that it will indeed start mass-manufacturing flexible displays in the fourth quarter of 2013. Thus, LG is likely to outpace Samsung and be the first one to deliver flexible displays to the market. “We have completed the development of our first flexible displays. We will mass produce flexible displays from the fourth quarter of this year,” LG said. LG will be making OLED displays supporting ultra-high definition (UHD). LG will manufacture the panels at its Paju factory in Korea. “We will apply a 4.5th generation glass-cutting technology for the OLED flexible displays. Monthly capacity for the line was set as 12,000 sheets,” the company explained. Not surprisingly, LG Electronics plans to take up the displays and be the first making a smartphone with the new flexible screen by the end of the year. Flexible-screen smartphones however will not remain exclusive to LG as the company is planning to sell the screens to other phone makers. The new technology will break the conventional cycles in the industry, and LG confirmed it is also working on TVs with flexible UHD displays. I am excited to see how these flexible displays change the industrial design of today's smartphones, I hope we can soon break free from the monotony of the "slab" design style. Atleast "soap like" designs. If you know what I mean. They should made flexible battery too to make the phone fold-able. Very excited and happy to see coming first from lg!!! I don't follow you...how could a flexible display effect power output. I can see the resolution causing power loss put not the flexibility of the screen. Besides with powerhouses like the Snapdragon 600/800, i really don't see any concern at all! I can't wait to see devices with this flexible displays....Lets see what they come up with..
Oh my god!!!! I cannot wait literally, this apple and. Nokia, is innovation!! Its important to note and Nokia is infact working on there on their on Flexible screen and is working on a scratch resistant, sun powered charged, water resistant options. Nokia R&D is in overdrive!! All the hype for unbreakable screens...my concern with flexible displays, made of plastic, is the scratch resistance. Unbreakable is great but over time with the accumulation of scratches on top of scratches concerns me. Lets just hope LG and Samsung have thought things through with this innovation! The iPhone can use this for their bending cases. Life is pretty simple: You do some stuff. Most fails. Some works. You do more of what works. If it works big, others quickly copy it. Then you do something else. The trick is the doing something else, LG.